The two-element SteppIR only requires only a six-foot separation of the two elements. This makes it ideally suited to putting near the peak of your roof line, assuming there aren't any obstructions to prevent you from doing so. Obviously the SteppIR dipole would work too but why not have two elements if they'll fit? How do you get it up there? 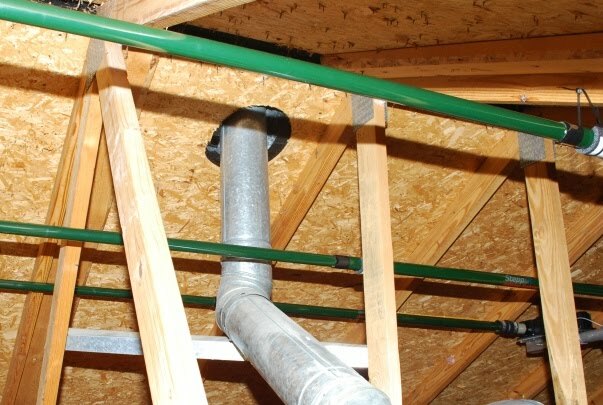 Because an attic-mounted SteppIR isn't exposed to the elements there's no need to assemble it in the recommended manner - namely swinging the telescopic elements to force the concentric tubes to seat firmly. Instead just lay the whole thing out on the ground, test it and collapse it all and re-assemble in the attic. Since the beryllium-copper tape with Teflon leader doesn't drag much on the inside of the element tubes, a light friction fit to the element joints is all that's necessary. I should add that this would have been easy had it not been for the 30/40m trombone kit. This requires elements be extended then cut to a specific length to accommodate the 180 degree returns. All I did was lay it out, cut the elements to length then mark each concentric element joint with a dab of bright yellow acrylic paint. Then I collapsed it all and re-assembled in the attic. All I had to do was extend the elements until the yellow dots appeared at the joints to know I had the elements back to their original lengths. I should also add that the 180 degree returns were the most difficult part of the assembly. They utilize a very course grip tape whose thickness makes it necessary to separate the compression joints much further than they were intended to be separated. I ended up reducing the grip tape surface area significantly to facilitate getting these on. Originally I mounted the boom rigidly to a roof truss. Bad idea. The resulting noise from the stepper motors inside the house was significant (as in S9 to the XYL). So began my efforts at decoupling. I started by suspending the entire array on para-cord. This didn't work as well as expected because the tension on the para-cord was enough to essentially make these piano strings. The ultimate solution was more suspension points and to cushion each suspension point. The cushion suspension points are foam pipe insulation (3/4" ID). The foam needs the force of the suspension spread out so I used plastic shower curtain rod cover on the outside of the foam. This is just thin plastic - maybe a 1/16th of an inch thick - that is pre-formed to curl around a shower curtain rod. The picture below shows the suspension assembly. The result is much less rigidity to the suspension and much less stepper motor noise being coupled into the living space. To further reduce the tension, once I had a dozen suspension points in place I removed the boom. The big unknown when putting up any attic antenna is the degree to which it will couple with and be degraded by the surrounding metallic objects. I have a furnace chimney to accommodate and as you can see below it's very close to the 30/40m return element. Since the beryllium-copper tape doesn't go all the way around and this pipe is orthogonal, it actually hasn't been an issue. The first 2-EL yagi was mounted in-line with the peak of the roof so it was relatively straight-forward. The second 2-EL yagi is perpendicular and thus the elements have to slope downward with the slope of the roof. I thought of two ways to deal with this. 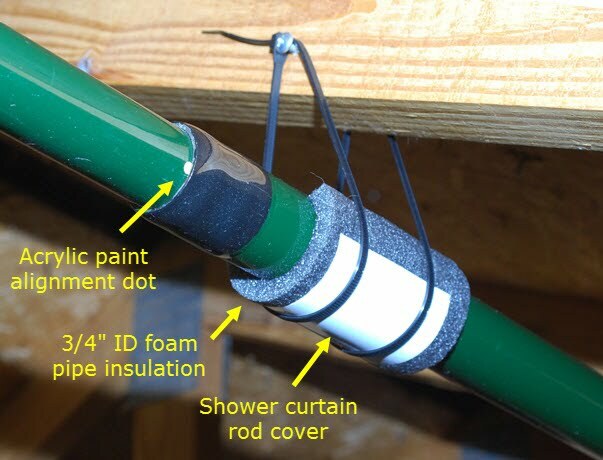 First, don't bother with the green fiberglass elements and instead use the same CPVC tubing that SteppIR ships with the 30/40m kit as guide tubing. This is flexible enough it would easily make a bend of a three foot radius - large enough to accomplish the slope but gentle enough not to distort the tube and possibly causing a beryllium-copper tape pinch. The second method is to use the green fiberglass elements but fashion a bend out of CPVC - in essence utilize guide tube long enough to get the tape into the green elements. More on this as soon as I take some pictures. To minimize coupling between the two antennas I mounted them in a disconnected tee wherein the perpendicular yagi is off the end of the first. I also figured if there was coupling, I could disable auto-rig-tracking on the unused array controller and put it in the 6m position to get the beryllium-copper tape further away from the active array. My previously flat 1.1 to 1 SWR on 30m and 40m with the original SteppIR has been seriously degraded by the presence of the second SteppIR. To compensate, I have to set the SteppIR controllers to manual and set the frequency about 300 kHz higher (shortening the elements) to get down to 2 to 1 SWR. This is disappointing but honestly I can't believe there aren't more issues so it's acceptable. Performance is somewhat an oxymoron when talking about indoor antennas but I do see about a 3 dB difference in gain and F/B as I flip between Normal and 180 on the SDA-100 controller (which changes the element lengths such that the director and driven for one direction are exchanged for reflector and driven in the opposite direction). So it's not much but it's an improvement over the mono-band dipole I'd used to obtain DXCC. I use EZ-NEC+ for antenna modeling and the results predict a predominantly NVIS pattern - a jelly bean shape that barely favors the desired direction. I created N13 gain files in EZ-NEC+ for use with ITS-HF (aka VOACAP and ICEPAC) propagation predictions. I use VE3NEA's Hamcap as a front-end to ITS-HF. Most of the time the prediction of when a station is workable is close to reality. Even though my attic has metal ducts and AC mains wiring I'm able to tune up with reasonable SWR 10m through 40m without any issues. 6m, however, has been a total no-go. I would have thought 40m would have been the most reactive given the length of the AC mains wiring runs but instead it's 6m. I cannot get below 4:1 SWR. I will add the 6m passive element and see if that helps. EZ-NEC+ models did not predict this behavior but they also don't have any of the adjacent metallic objects incorporated. Your mileage, as usual, will vary.